Creating happy tanners in Newmarket for over 15 years. Welcome to Planet Sun Tanning & Sunless Spa in Newmarket! 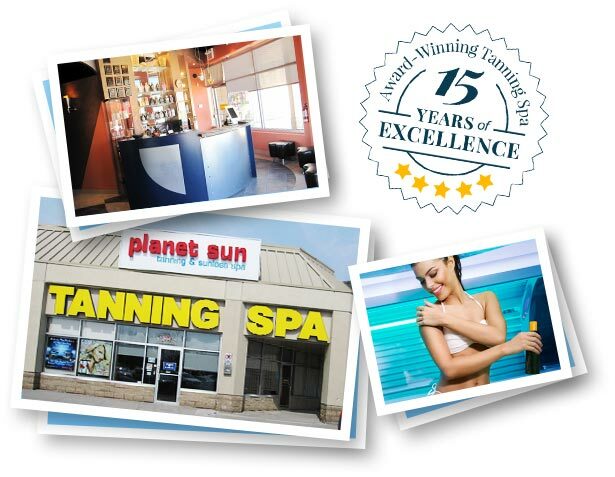 Planet Sun is an award-winning tanning salon and sunless spa that has been serving Newmarket, Aurora and surrounding areas since 2000 by providing exceptional customer service at 2 Newmarket tanning salons. Our friendly and certified tanning consultants will take the time to ensure that you always receive an enjoyable and comfortable UV tanning and spray tanning experience. Enjoy our Top-Rated Tanning Beds to Get the Perfect Tan! See our featured tanning beds and reserve your session today! Exposure to UV light not only makes you look great, it also makes you feel great. By looking great you naturally feel better about yourself. But sunlight exposure can also lift our spirits in ways that go beyond a beautiful tan. Get a UV-Free tan to achieve a flawless and natural looking tan. The revolutionary heated sunless tanning treatment will keep you warm & dry from start to finish! From the moment you enter the warm and inviting booth, your skin is infused with heat which allows for maximum absorption, creating a deeper, flawless & longer lasting tan. The sweeping side to side airbrush travels gently from head to toe applying precise amounts of your desired level of colour to achieve a beautiful spray tan! Take advantage of UV teeth whitening while you tan. UV teeth whitening is one of the easiest, most cost effective procedures you can do to improve your appearance. Now you can obtain whitening results that only Dentists could achieve, as well as save time and money, by using Twilight Teeth during your tanning session. It’s complete with a small, comfortable mouthpiece and a simple application process with an enjoyable mint flavor.